Currently I'm just happy to have found the it's Tomcat/Jasper that's picky (during compilation) but I haven't looked at neither specification nor code. 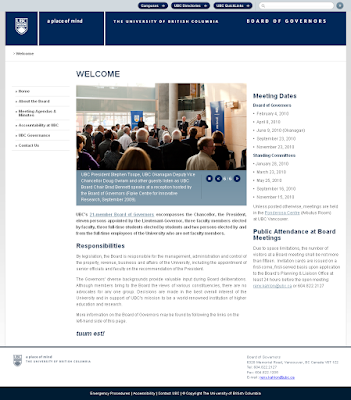 The UBC CLF, or "common look and feel", is a web design framework that supports the visual identity and online reputation of the University of British Columbia by providing a common look, feel and functionality to UBC websites. 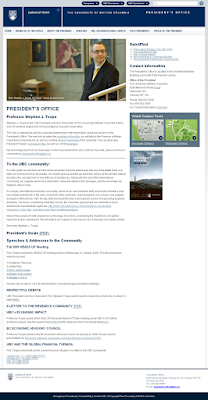 Ensure that UBC websites consistently support the visual identity of the university. I like this definition as it is clear and understandable. It would not be fair to start dissecting it before having a closer look at how it's defined in practice, in the Design Specifications of the CLF. The CLF Framework is devided into Primary- and Secondary-CLF Elements. Are relevant to all campus locations. 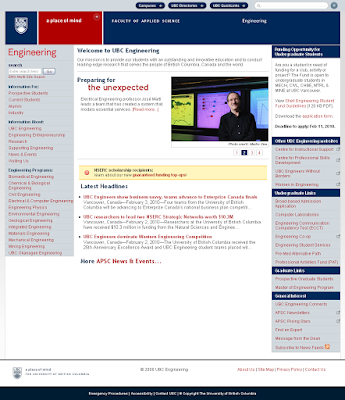 Optional content, links and functionality that adhere to a university-wide standard. Reserved space for these required and optional university-wide elements. 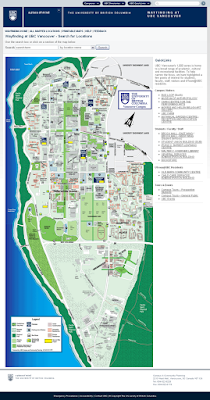 Required content, design, links and functionality to mark campus location where appropriate. Site-specific content, design, links, and functionality that can be customized on a site-by-site basis to accommodate localization of unit-level needs (e.g. Campus location, Faculty / Departmental-specific information etc.). Reserved space for these site-specific elements. The Full CLF consists of the Minimum CLF elements and the optional content areas of the templates including CSS styles and layouts. The area highlighted in red in the graphic image below indicates the optional content areas which together with the green areas make up the Full CLF. UBC has a list of complying websites: websites have completed CLF implementation. I've picked some of these sites to have a closer look for one to see the variation and to ensure that it actually runs on different servers/setups. 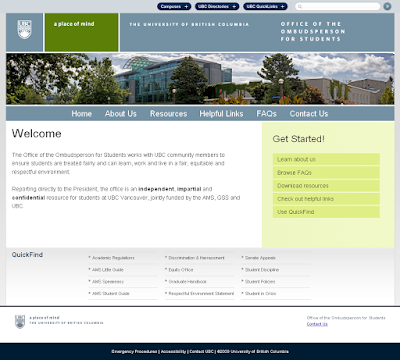 Office of the Ombudsperson for Students has the URL http://www.ombudsoffice.ubc.ca/. Without knowing the effect or cost I still want to congratulate UBC for their work and making the material availble online.